Crystal Therapist Perspective: Opal is a soothing stone, helping to balance mood swings. So why do I and other Crystal Therapists love Opal so much as a healing stone? Opal, the queen of gems, is the most mysterious and bewitching of gems. Legend tells us that Opal fell from the heavens when lightning struck the earth. Then Opal took a great breath in and absorbed all of Lightning’s healing energies and the colors of the rainbow. How fantastic is that?! Opal acts as a prism in the aura, which infuses a full spectrum of light energy to all the systems. It soothes and clears the physical, mental and emotional bodies. Opal is a soothing stone, helping to balance mood swings. It supports you in not becoming overwhelmed with your own feelings. Sometimes introspection can magnify one’s deepest fears and may be uncomfortable. Fortunately, Opal assists in the process of letting fears go. Safely. Comfortably. Feng Shui teaches us the element of water represents emotions. Opals entrap water and hence have the ability to intensify emotions and release inhibitions. From a Crystal Therapist’s perspective, the Opal is considered an emotional stone. It reflects the mood of the wearer. This reflection of mood could be likened to the mood ring of the 1970’s. I use Opal as a complete chakra healing stone. Furthermore, in my view, it is the best and only stone to use for aura healings. © Margaret Loris, Crystal Therapist, author and instructor of Crystals for Healing: Crystal Therapy in Multi Dimensions. Crystals support healing in that negative energy that has manifested into emotional, mental, spiritual or physical distress or illness may be released and transmuted. Then deep and profound healing may occur. Margaret’s crystal therapy course focuses on the why, when, where, what, and how to use crystals for the healing of the self and others. 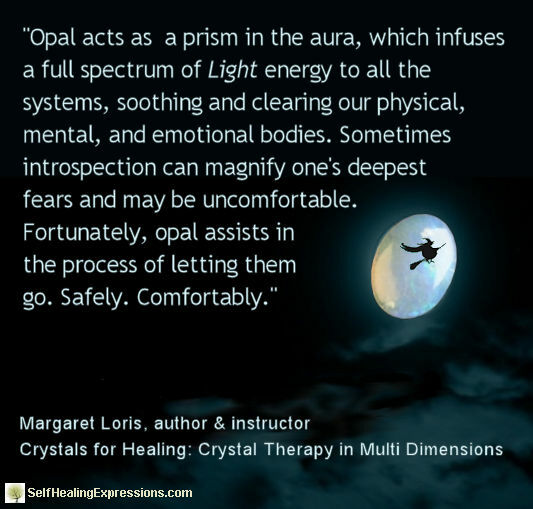 Next time, we’ll share a brief Opal Aura Repair Meditation by Margaret. Her popular course is on sale this week! You are invited to enroll now. May Your Spirit be Bright and Beautiful! This entry was posted in Crystals for Healing and tagged crystal therapist, crystals for healing, opal by June Cook. Bookmark the permalink.